Anthropologie is one of my favorite places to shop, but sometimes the decor that I love is just a biiit out of my price range. I recently saw these tasseled baskets on their website and thought it would be fun to recreate it on a budget. Today I'm showing you the step by step DIY as well as the price breakdown. The one was definitely a win! The first step is to find a basket. I headed to my local Goodwill and was able to find a basket that is pretty close in size and color to the one on the Anthropologie website. To make my basket work for this project, I just had to find a way to remove the handle. I found that I could easily cut right through the pieces of wood that were holding it together with a pair of scissors. If your basket has a handle, continue cutting away the pieces that are holding it together and then pull it apart on both sides. For the tassels, you will need 2 colors of yarn. I wanted to stick pretty close to the original so I chose the colors grey and cream, but as always you can customize this to your decor style. To make a tassel, start wrapping yarn around your hand. The more you wrap, the thicker the tassel will be. The tassels on the Anthropologie basket are pretty thick so I wrapped my yarn around quite a few times. Once you're happy with the size of the tassel, cut the yarn. Cut one more piece of yarn that is about 6 inches long. 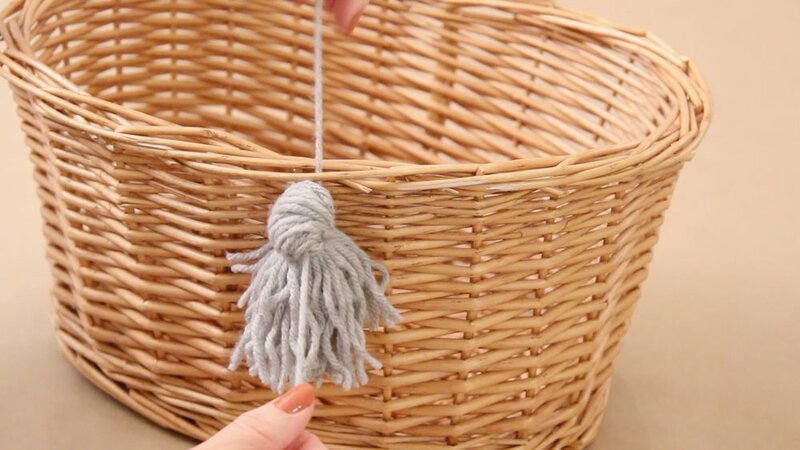 Slide the extra piece of yarn under the yarn on your hand, and then use it to pull the entire bunch off of your hand. Cut yet another piece of yarn (last one, I promise!) and lay the tassel on top of it. Tie a double knot at the top of the tassel to create the rounded top. Slide the scissors through the loop at the bottom and cut all the way through. Trim the ends as needed to make them even. Find a point on the basket where you can attach the tassels, mine had a band across the top where I could easily slide the yarn underneath and tie a double knot. Continue adding tassels in alternating colors all the way around the basket and there you have it! I think this turned out pretty darn close to the original and was a fraction of the price! I purchased my basket at Goodwill for $2.20 and all of the yarn for $6. That brings the total cost of this project to $8.20 as compared to the Anthropologie basket which cost $52. This was extremely easy to accomplish and took about 45 minutes from start to finish. If you like the look of the basket but don't want to spend a ton of money, I definitely recommend giving it a go! If you want to see a full step by step video tutorial, watch below!